One nice feature of the stock market is that you don’t have to reinvest your income to benefit from compound interest. That’s because most companies retain a significant portion of their profits even after dividends have been paid. Those retained profits are then re-invested in the business, compounding profits even if you don’t reinvest your dividends. 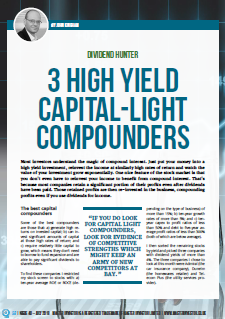 Some of the best profit compounders are known as capital-light compounders. require relatively little capital to grow, which means they don’t need to borrow to fund expansion and are able to pay significant dividends to shareholders. Disclosure: There aren’t many high yield capital-light compounders out there, so I’m personally invested in all three of these companies and they’re all holdings in the UK Value Investor model portfolio. >>> On the other end of the consideration, there is very little barrier to entry – that’s why there are hundreds of insurance companies. The comparison web sites benefit from first mover advantage and confused (strange name) has been around a long time, so that’s good, although there are now lots of them out there. Admiral has very poor dividend cover at 1X profits so you could argue it’s over paying to keep the attraction of it’s share price higher than it should be on a P/E of 16 and a negative growth last year, in 2016 and in 2014. Admiral’s share price has been flat for 2 and a half years for this reason. It’s finding growth harder to come by. Dunelm – There’s no denying that Duelm has been a terrible investment for the last 4.5 years having had it’s share price cut in half from £10 to £5 today in what is a very crowded market for home ware products and furniture. Like Admiral the company is finding it difficult to grow in a highly squeezed and competitive market. I’m not sure it’s just a flavour of the month issue and not more a “structural change issue” and Dunelm has been feeling that. Not sure where you get the growth from, because it simply hasn’t done so for 5 years. It’s revenue has grown but it’s profits and earnings are lower now than 5 years ago. There is nothing different about this, as all electricity and gas providers supply via National Grid. Plus if you exclude generation capacity for gas or electricity (of the big six – soon to be big 5), then there are dozens of companies marketing this service from Bulb to Iresa to all the dozens that come up on a comparison web site. Again Telecom Plus has been a terrible investment over 5 years, having fallen from £19 back in Jan 2014 to £11 today — that’s a long period of decline and it’s a reflection on the over competitiveness of this industry. Telecom Plus is another company with very slim dividend coverage at 1.2 on an overly optimistic, perhaps, dividend yield of 6% plus (a possible alarm bell to look out for). John, whilst the 3 companies satisfy certain criteria in your discussion points, I think there are some key elements missing in the assessment, namely “competitive landscape”, “low barrier to entry – no real moat” and “low profit margins”, “very little IP value”, and relatively high operational gearing. It would be great to see 3 companies to replace them that have high margins, a difficult to replicate product or brand, and some global reach that doesn’t allow them to be dependent on a saturated UK market. LR — Sorry to sound so harsh, and some of my points may not be entirely correct, however the performance of two of their declining 5 year share prices and a flat one over almost 3 years in Admiral’s case does seem to speak volumes. Non of these companies are on my track list. Capital-light = high competition: This is why there are so many tech startups. You just need a few nerds and a computer and you’re good to go! The key is competitive advantages and in insurance that comes down to scale and disciplined pricing. Scale is key and Admiral has spent more than a decade losing money on its European operations as it builds scale over there. The biggest/oldest of those companies are beginning to show profits rather than losses, and they have the potential to replicate Admiral’s success and scale in the UK in multiple countries. But of course that’s easier said than done. On Admiral’s weedy dividend cover, you could also say that the company just doesn’t need to retain profits, so the only sensible thing to do is pay it out to shareholders. The growth rate is over ten years, so the recent lack of growth doesn’t really show up yet. The story here is the same as for any retailer, i.e. it’s all about the internet. Dunelm has an internet presence and acquired Worldstores for this reason. But again, who knows. I’m just backing a winning horse and on average that tends to work. Yes, there’s National Grid, but e.g. SSE owns network businesses in Scotland. More interestingly, the barriers to entry are indeed low and there is lots of competition. But Telecom Plus invented this game way back and is the market leader. Scale, scale and more scale. Plus it’s the only one that uses multi-level-marketing in a serious way, which is odd but at least it’s different. As I said at the outset, this certainly isn’t a defence of these companies. I have no idea what’s going to happen to them over the next five or ten years, but over the last decade and more they’ve all had pretty impressive track records of growth and profitability, using little or no debt to do it. And they’re all market leaders (actually, not 100% sure Admiral is, but it’s certainly #2 at least). So these are “good” and perhaps “excellent” companies by my definition. As for their weak share price performance over the last few years, that should be irrelevant to long-term investors. All I care about is the price I paid and the long-run return on that investment, not the fact that other investors might have wanted to pay much more for the same company a few years before I invested. Hopefully that doesn’t sound too argumentative as it isn’t meant to be. I value your robust comments as always! John, Not argumentative at all, it’s good stuff like thi that you take the time to produce, that forces (or allows more like) some useful debate. I’m of the personal belief that all three of these companies will be blown away in coming years — but that’s only my judgement, it’s clearly not yours. I’ve come to the conclusion, for some time now, that the areas to invest in are those with high barriers to entry and special IP or brands, high profit margins and in some cases, not all, the ability to scale on the internet. You have these in your portfolio as well of course. Burberry is an example, Victrex to some degree . Would be interesting if you ran a parallel set of criteria and another portfolio that considered companies that didn’t require the 10 years track record which forms part of your main portfolio selection. There are some very positive areas where companies that indeed have more than a ten year track record, but not as a listed entity. Strix is good example of this. Also selected AIM companies – e.g. Advanced Medical Solutions, Churchill China are two examples. Oh and of my last post — Ted Baker is worth some coverage. It would be great if I could run lots of parallel portfolios to compare different strategies, or even just minor differences. But… time is in limited supply (!) and I have other fish to fry, so I’ll have to leave the delights of multiple experimental portfolios to others (I realise that this sort of thing can be automated, but I’m not sure that automated portfolios can teach us very much about real-world investing as they lack the emotional/psychological side of things). And keep banging the Ted Baker drum. I’ll get round to writing about it at some point. Just want to say I agree that debate and discussion is healthy. Mainly because I myself would never purchase or pay an extortionate price for a clothing or fashion item. To me its a total waste of money. So what is the thinking why these companies will continue to do well in the future? Peoples disposable incomes and salaries are being squeezed at every turn, house and rent prices are sky high, aswell as food prices. Basically cost of living. How much money are people going to have to spend on fashion/clothes/bags in future especially when your just paying for the brand/label. Hi Kindke, I’ve just finished a review of Ted Baker for Master Investor magazine, so I’ll re-post it here once it’s out (start of August). The basic idea is that these are global brands that appeal to young affluent consumers and that’s a rapidly growing demographic, at least globally. And yes, while I agree that paying top-dollar for clothing may seem odd (my wife buys most of my clothes, from Tesco I think!) there are lots of people that disagree. So as long as these companies can maintain the attractiveness of their brands (Burberry knows all about this from its baseball cap disaster in the 90s) and the quality of their garb, then I think they both have the potential (though no guarantees) for a relatively bright future. Kindle I know exactly where you are coming from, and whilst John gets his clothes from Tesco, I am slightly up market from that but not ever so greatly mind ! I learned long ago that I’m a very poor model of the consumer. I poo pooed Sky thinking “who on earth would pay for TV” — look at it now I was wrong. I laughed at Facebook, look at it now. I don’t use Facebook at all, I wouldn’t dream of splashing my personal info on the web unnecessarily but now I own shares in it to significant reward to date. I think people are chumps for paying £750 for an iPhone when I have a faster Motorola model for £150, but I’ve just doubled my money on Apple stock. I thought Jeff Bezo’s was nuts when he started Amazon, I still “sadly” don’t own the shares — which makes me not only out of line with Mr Bezos , but me a bozo I suppose. It’s hard and yes I don’t splurge often on luxury goods or brand items or brand new cars, but I must confess to having bought a Ted Baker Endurance suit and it’s up there with some of the best. I bought Burberry shares a while ago and sold with a 60% profit. I think Ted Baker shares are where Burberry was a couple of years ago, so I’ve switched my attention to that as my single fashion stock, apart from Estee Lauder which is a more smelly type of fashion – needless to say I don’t use the product lol ! I now rely on the views of the masses – I guess I’m personally out of line with the masses. Do you like the other insurers (Direct Line, Esure but also Aviva, Legal&General…) or Admiral for you is the best at this price ? Hi Eric, thanks for your comment. I don’t like to talk too much about what I do and don’t own because that isn’t fair to paying subscribers, but for whatever reason I do own several insurers. Admiral isn’t the top-ranked insurer, but it’s my favourite (although of course that doesn’t mean it will be the best performer). I just like its straight-forward approach and of course its financial qualities. Thank you John, I understand. 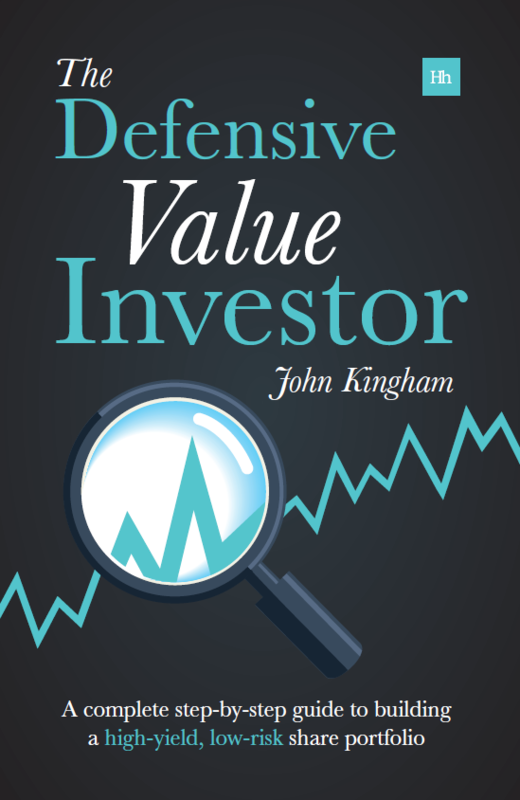 The UK market has a lot of high-yielding shares with low valuation. John, Did you do a write up on Ted Baker before the end of July? Indeed I did. 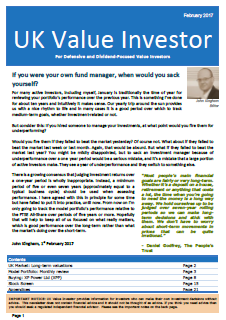 It’s in the latest Master Investor magazine. John, thx – just read it – seems reasonable. In many respects I see Ted’s current valuation at a similar level to Burberry a couple of years ago. Also I think the growth potential is greater than Burberry, given that Burberry is already a top 100 brand and is more widely established. The new CEO at Burberry has made a move up the exclusivity area too much I think and I took profits. Some of th proceeds are now in Ted — It’s 1.2% of my portfolio but considering making it closer to 2%. The August price looks better for you, as it was 2300 at the time of your article and at 2200 it’s PE and PD10 figures are more within range lol ! John, I’m guessing you sold Senior and bought Ted Baker by now yes? Hi LR, Senior is still hanging on in there but yes, Ted Baker is now in the portfolio. John – I think (although one never knows of course) it’s a good move, and possibly there are a few more pips to squeeze out of SNR. Shame your model doesn’t stretch to Melrose. Strange set up with a pseudo public private equity model. I see them making a tidy return on the divisional splits at GKN. Bought back into DOM on the big drop, having sold it last year for a decent turn — never set out to be a trader, though waiting a year can hardly label me as the worst kind of trader can it?